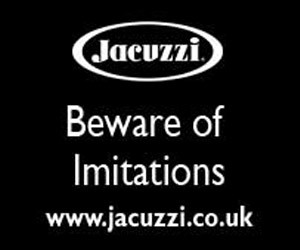 Hot tub and wet leisure powerhouse Certikin is pulling out all the stops to ensure it is the stand out exhibitor at SPATEX with a triple stand presence bursting with new products and innovations. As part of a wide range of options for current and prospective dealers, the Caldera Spas distributor will be putting the spotlight on the Caldera Spas Geneva and Fantasy Spas Drift at SPATEX, running from Tuesday, January 30, to Thursday, February 1. A massive tiled spa is also scheduled to be on display on the Certikin Stand D10; which will also be highlighting the new Provence and Florence hot tub models as part of the enhanced Caldera Spas range. The Geneva, one of the Utopia Series options from the Caldera Spas production line of hot tub giant Watkins Wellness, is being rolled out for display at the exhibition as a showcase of the brand’s message; ‘Comfort, Style and Performance’ and to help attract additional dealers to the Caldera Spas network, which is supplied exclusively in the UK by Certikin. With the Geneva, there is no skimping on space. It is an imposing model, featuring uniquely contoured ergonomic seats to provide the benefits of buoyancy to realign the user’s body; coupled with the unique FootRidge to keep occupants seated comfortably. Two 2.5hp pumps and 55 powerful jets, exclusive to Caldera Spas, deliver true hot tub Circuit Therapy. Additionally, this feature heavy model is loaded with the Atlas Neck Massage System™, UltraMassage™ Lounger and Dual Euphoria™ lower leg massage jets to home in on those areas that benefit the most from hydromassage. The stunning, contemporary looks and lighting all come courtesy of a unique partnership with the BMW Designworks team and provide a real centre piece to any outdoor setting. Using FiberCor, its insulation is second to none so when coupled with the unique EnergyPro™ Circulation pump heating costs are kept to a minimum. All Utopia Series models come complete with the Monarch CD Ozone System, SpaFrog and an optional Bluetooth Music System. Certikin has recently introduced a stunning new edition of the popular Fantasy Drift ‘plug and play’ hot tub to its large range of dealer options and will have one on display at SPATEX on Stand D10. 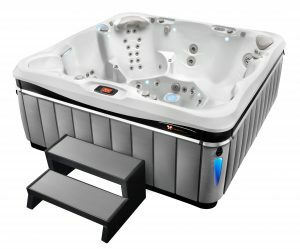 The Drift; which compliments the other four recently improved Fantasy Spas models, Entice, Splendor, Embrace and Aspire; has achieved strong sales and due to its popularity has been significantly upgraded to ensure it continues to bear the hallmark of a quality product at an affordable price for dealers to promote in their showrooms this year. Visitors to the Certikin Stand D10 will quickly see that the Drift is extremely spacious, and that the new interior design of the four-person hot tub has been ingeniously thought out to give even more seating comfort and the seating configuration now allows for a cool-down seat. Coming in at 68” x 63”x 32”, it is an ideal size for patios and decking and its unibody is superlight. The cabinet is manufactured from polyethylene resin which is rotationally molded and highly durable. The 17 jets are all stainless steel trimmed and a dual therapy system offers gentle massage with the lighter speed setting or vigorous massage on the higher speed. A multi-coloured cascading waterfall and an LED light adds to the hot tub’s appeal. The Drift comes with a 1.5 HP pump and ensures electricity bills are low with its full foam insulation and locking thermal cover. Certikin Sales Manager for Portable Spas, Enclosures and One Piece Pools David Steptoe will also be on hand to provide details about the Caldera Spas dealer opportunities and the new user-friendly touchscreen control panel for all of the 2018 Caldera Spas Utopia Series models; as well as promoting the launch of the new Caldera Spas Provence and Florence models. Coming in at 213cm x 198cm x 89cm. the Provence is being proclaimed as a stunning new four-person model, which has been designed to allow dealers to meet consumer demand for a smaller spa with two lounger seats; while the Florence, pictured, comes in at 213cm x 213cm x 91cm and is a larger and open seating design option for showrooms to promote this year. Certikin’s H&V specialists will be manning the display of Calorex product offerings, with the newly-launch revamped branding, being showcased on the Calorex Stand C14; and they are available to provide advice on carbon conscious Calorex units; which can reduce pool running costs and demonstrate the technicalities of Calorex’s best-selling equipment. The new affordable and easy to install Dantherm HPP heat pump is also being rolled out for visitors to the stand to gain further information on. “Certikin regards SPATEX as one of the industry’s most important dates and it’s a great opportunity to fly the flag both for ourselves and the industry as a whole,” said Certikin Marketing Manager Cath Saunders. To find out about more about the Caldera Spas range and becoming a dealer visit Certikin on Stand D10 during SPATEX or call Certikin directly on 01993 778855.